The photograph shows prefects of Fawcett School in 1949. Front row (left to right): P. Hudson, R. Elliott, J. Sweet, A. Wilson, Headmaster Mr. Carter, L. Holland, P. Vinall, H.Crudge, D. Wyndam. Do you recognise yourself – or anyone else? Please leave a comment below. Click on the image for the large version photo to open in a new window. I remember getting a right telling off for putting my hand in my pocket (back right). Did the same in the Form 4a photo. Am trying to find my copy of these along with form reports etc. Have got the plaster cast shield of the school badge given to us and the first silver medal for sportsmanship. Dereck Beard was the star of the football team, played for Brighton Boys at center forward. There must be one or two of the above out their – add a few lines. Best wishes. I remember a lot of the prefects in the picture – Mick Gravett was a very good friend of mine and my brother Ken. Mick died some years ago and I wonder how many more are still with us? Brings back a lot of memories. Didn’t you used to play football for the school, Fuzzy? 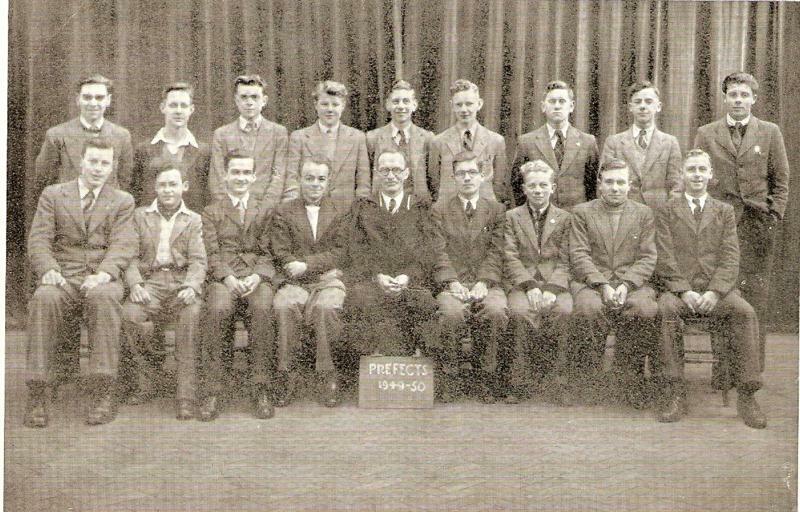 Having recently reached the grand age of 80 years I hope many of my fellow prefects of 1949 are still around. All good wishes from Peter Hudson the tall lanky one sitting down on the far left. The only one I remember is Peter Vinall from the photograph. I have been living in Tokyo for the last 33 years, but every summer I come to Brighton and while I’m there the memories keep flooding back.